The co-founder of the Stanford d.School introduces the power of design thinking to help you achieve goals you never thought possible.Achievement can be learned. It’s a muscle, and once you learn how to flex it, you’ll be able to meet life’s challenges and fulfill your goals, Bernard Roth, Academic Director at the Stanford d.school contends.In The Achievement Habit, Roth applies the remarkable insights that stem from design thinking—previously used to solve large scale projects—to help us realize the power for positive change we all have within us. Roth leads us through a series of discussions, stories, recommendations, and exercises designed to help us create a different experience in our lives. He shares invaluable insights we can use to gain confidence to do what we’ve always wanted and overcome obstacles that hamper us from reaching our potential, including: Don’t try—DO; Excuses are self-defeating; Believe you are a doer and achiever and you’ll become one; Build resiliency by reinforcing what you do rather than what you accomplish; Learn to ignore distractions that prevent you from achieving your goals; Become open to learning from your own experience and from those around you; And more.The brain is complex and is always working with our egos to sabotage our best intentions. But we can be mindful; we can create habits that make our lives better. 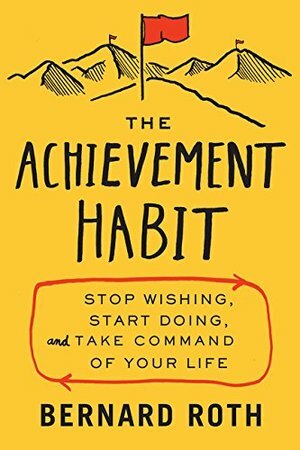 Thoughtful and powerful The Achievement Habit shows you how. I listened to the audio - it would be good to get a copy of the print version. Lot of interesting ideas.